People occasionally ask, “Where can I see you perform?”, and the opportunity doesn’t come up often. Most of my shows are for businesses, organizations, or private parties and I can’t just invite people to attend. Then, out of the blue, something like this comes up: on Saturday, May 4, 2013 I’m doing three shows, all open to the public, that you’re welcome to check out. Tacoma Art Museum’s 10th Anniversary Celebration. Doors open at 10:00 am, magic show at 11:00 am, and many other festivities and activities until 4:00 pm. Museum admission is required. Co-opatopia at Saint Martin’s University in Lacey. Discover the power of co-ops, whether you’re buying locally grown food, opening a bank account, or paying for your healthcare. I’m performing strolling magic at 2:00 pm and a stage show (in the Worthington Center?) at 3:00 pm. Free admission. 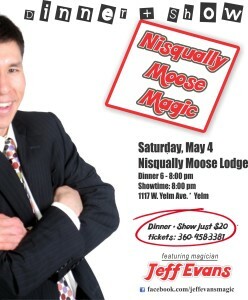 Nisqually Moose Lodge in Yelm. CANCELLED – Due to low ticket sales, this show will be rescheduled for a Saturday in July. E-mail me for updates, or be a fan on Facebook where I’ll announce it. 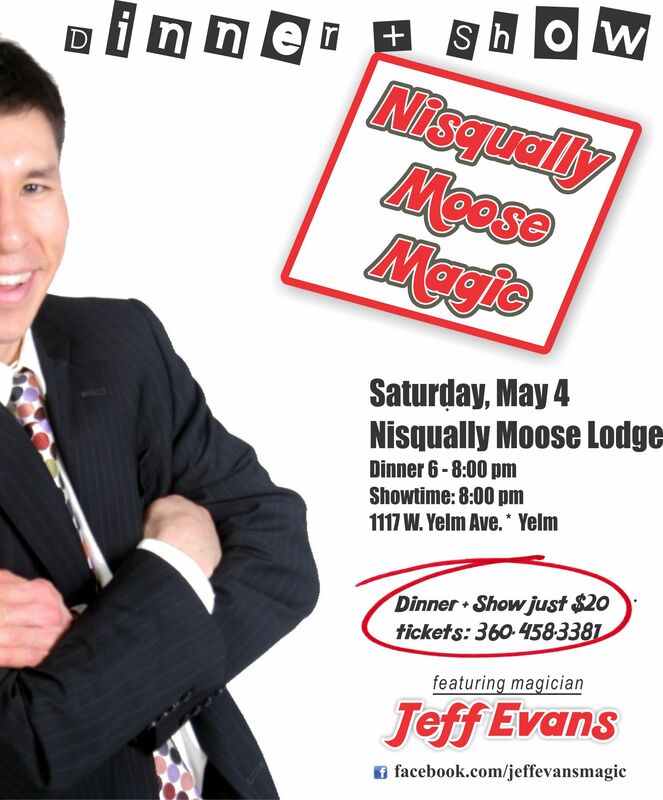 This entry was posted in Uncategorized and tagged coopatopia, magic show, magician, Moose lodge, olympia magician, Tacoma magician, Yelm magician. Bookmark the permalink.